UPDATE: I made a Facebook Page for him. Please like and spread the word if you can! VOXEL WAS LAST SEEN IN THE DURHAM CHAPEL HILL NC AREA 6205 FARRINGTON ROAD on SUNDAY the 24th. He Could have flown far, or have been picked up by a cat or someone and brought to a shelter, rescue, vet, etc. Voxel is an English Budgie/Parakeet. He's about 7 inches in length, blue nose, and is a cream colour with yellow patches. Very friendly and will step up on your finger or sit on your shoulder. He's very talkative! Loves it if you say 'budgie budgie budgie' to him. 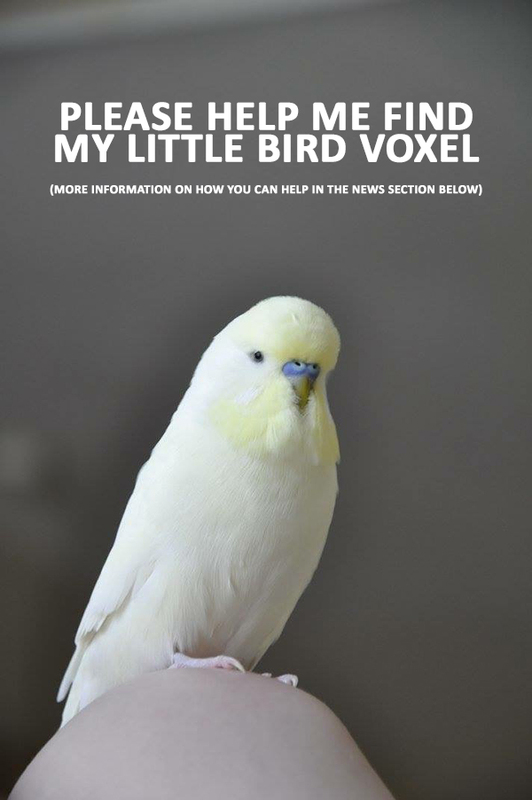 If seen, or know someone who has recently found a parakeet matching Voxel's description PLEASE CONTACT US RIGHT AWAY!! IF HE COMES TO YOU: DO NOT TRY TO GRAB HIM WHILE OUTSIDE HE WILL FLY AWAY. Let him land on you, just be calm and still and coo at him, tell him he's a good bird or 'budgie budgie budgie' then CALMLY walk indoors. He LOVES seed and bread. But again, if you see him at ALL please contact us RIGHT AWAY. DAY OR NIGHT. RAIN OR SHINE. I'm BEYOND distraught right now and in a total meltdown panic. Please share with your friends, family, co-workers and your social media if at all possible. I need all the help I can get right now and the more eyes looking for him the better.